Mitchell Prehistoric Indian Village, South Dakota: Economy and Connectivity of the Earliest Agriculturalists on the Northern Plains. The Mitchell Prehistoric Indian Village is located in the Northern Plains of the upper mid-west, on a small bluff above the former floodplain of Firesteel Creek. Excavations at the site have been in progress for more than a decade thanks to a permanent building called the Archeodome, which covers and protects a portion of the site and provides gantries and walkways for visitors to view the archaeology. The building allows a year-round open excavation area of two rectangular lodge houses and, notably, the spaces between them. While houses had been the focus of excavations on these types of sites in the past, it was decided to use the opportunity of open area excavation to investigate the intra-house space and the activities that happened there. The site provides a fieldschool for students from Exeter University and Augustana College, Sioux Falls. Artistic interpretation depicting the interpreted use of a bone grease processing feature (Karr et al. 2015: 4). The archaeology suggests that the settlement subsisted on maize, bean and squash agriculture, with meat coming primarily from hunted animals such as Bison. Fish, shellfish and birds were also commonly eaten, and domestic dogs were a part of life on the site. The excavations have revealed highly organised storage pits that were clearly systematically used, along with earth ovens and a feature interpreted as a bone grease processing area. Bone fats are identified as being of considerable importance to the people who lived in the village, and investigations are ongoing to see if it was used as a tradable commodity. Flint points and potentially pottery linked to the contemporary cultural hub of Cahokia, in Illinois, have been occasionally found at Mitchell. Professor Outram is currently working with Prof. Richard Evershed, using lipid residue analysis to attempt to determine whether fat from Mitchell can be detected in ceramics from Cahokia. 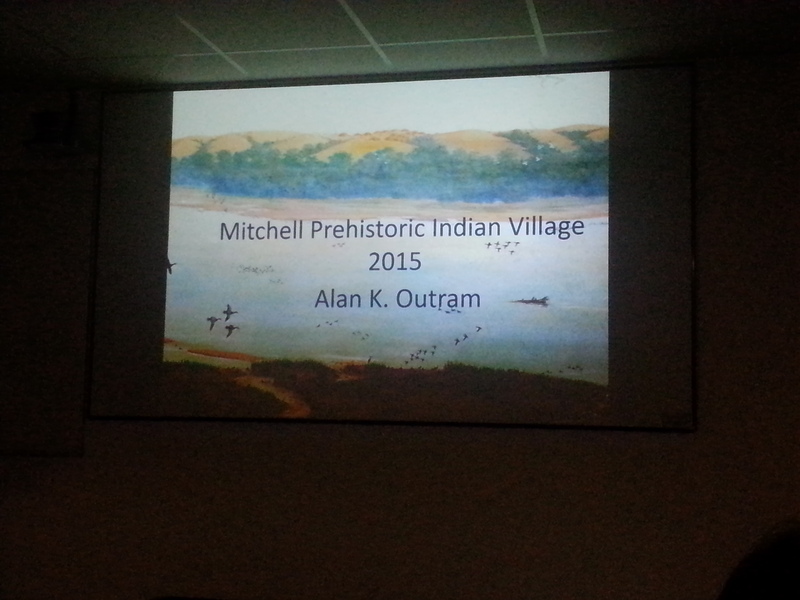 We’d like to thank Alan for his incredibly thorough presentation of work past, present and future at Mitchell. The site has special significance and fondness for many students who have been involved in excavations, and it was great to see the continued progress of work at this data-rich site. You can find out more about Professor Outram’s work at Mitchell and his other research interests here, or view photos from the most recent excavations on the Archaeology Department’s facebook page. You can also visit the Mitchell Prehistoric Indian Village website, or follow them on twitter. Karr, L.P., Short, A.E.G., Hannus, L.A. and Outram, A.K. 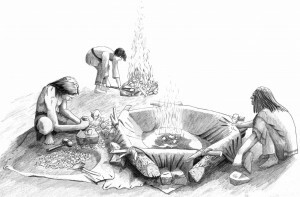 (2015): A bone grease processing station at the Mitchell Prehistoric Indian Village: Archaeological evidence for the exploitation of bone fats. Environmental Archaeology, 20(1), pp. 1-12. This entry was posted in Around the Department, Research Seminars and tagged archaeology, mitchell, prehistory, research, south dakota, subsistence, trade on 26th Oct, 2015 by Emily Victoria Johnson.